For me the most joyous years are those when Advent I is the Sunday after Thanksgiving weekend. At Washington National Cathedral, our Thanksgiving arrangements are bountiful, filled with glorious fruits and blossoms and branches that we have dried or preserved in glycerin. The Cathedral is visited by hundreds of visitors, many interested in seeing our displays and sharing their ideas. This year, like so many others before, on Friday and Saturday after turkey dinners and turkey soup, we will dismantle all of the golds and oranges and reds, replacing them with evergreens, ivy and magnolia. Our Canterbury pulpit and lectern will be hung with green garlands. During the course of Advent, all altars will be decorated with a mixture of greenery. I call it a “green salad” when our volunteers come in to choose the cedar, juniper, balsam, pine, and other treasures from the buffet of assorted greens they will use in their arrangements. Though we are still aglow from our family gatherings, there is an amazing comfort and elegance in the scent and simplicity of the Advent greens. Like age we soon learn to respect and accept these displays even when they become rather crisp! This year at the Cathedral, we are breaking tradition. Our Dean and Canon Precentor would like some Christmas color for Advent IV. Therefore for that Sunday we will bring out some of the 500 individual potted poinsettias we have put into quart-size plastic bags, some wide-wired red ribbon, crab, lady and rome apples, cones, and nandina berries. Our services will be filled with joyous Christmas music and we will start celebrating the magic of Christmas a bit earlier than usual. During the next few days we will be adding hydrangeas, gold-enhanced greenery, carnations (for which we must all be thankful), winterberries, ginger, and preserved roses. I must choose material carefully for all to last until Epiphany. Our designs vary from year to year. 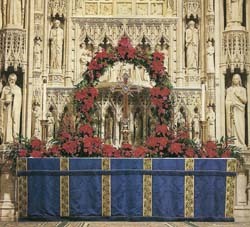 I think the one photographed here, for our High Altar, is the most beautiful we have done in my 43 years on the Guild. Credit goes to Tania Palmer who carefully attached each poinsettia to a garden arch. I wish you all the joys of Christmas as you decorate your churches aware of God’s kindness in the beauty of flowers. To bag poinsettias: use individual 4 ½ inch poinsettia plants. First day water thoroughly. Second day, tip out of the pot and with soil, slip each plant into a quart-size plastic bag. If this is a Ziploc, cut off the “zip.” Close the bag tightly around the stem with ½ a chenille stem (pipe cleaner). Shellac all fruit with “bull’s eye” shellac. Apples will last longer and beautifully reflect the light. The preserved roses we use come from Mirsky, Inc. or Mountain Farms, Inc. If you intend to use these roses in arrangements and wish to use them again as we do, you will need to wire them; otherwise, they can be glued in place on a wreath or topiary.